"A Toadally Magical Adventure" is the thirteenth episode of The Adventures of Super Mario Bros. 3. It originally aired alongside the episode "Misadventures in Babysitting". A messenger working for the Wizard King of the West arrives at the Ace Magic Wand Factory ("A New Wand Made Every Century") to pick up an important delivery. The wand maker who works there brings the messenger in and gives the package - a special wand that the Wizard King ordered to have made for him fifty years ago (its spells emit from a crystal in place of the usual orb). Meanwhile, in his castle, the Wizard King is watching this, commenting that it is about time "that slowpoke" finished making the wand. Just as the messenger is leaving the store, though, the Wizard King's crystal ball clouds up and shows a different vision - close by, on the ground portion of Sky Land, King Koopa and the Koopalings (or rather just Cheatsy, Kootie Pie, Bully, and Big Mouth) are plotting to steal the wand. The Wizard King of the West. Over at Toad's House, Mario is busy repairing the drainpipes on Toad's bathtub while Luigi and the Princess watch. 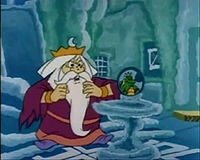 Just then, an image of the Wizard King appears in the bathtub's water, alerting the Mario Bros. about the Koopas' plot and showing the image he received of their ambush site. Toad accidentally drains the water by causing Mario's wrench to turn one more time, but he manages to get a good look at the ambush site and tells the others he can lead them to it. Soon, thanks to Toad's guidance, the group arrives at the waterfall just in time to find the messenger on the run from the Koopas. Upon meeting with the heroes, the messenger hands the wand (and the case it is in) to Toad, and Luigi carries him out of the way. The Koopas attempt to chase them down, but Mario luckily grabs a Fire Flower and transforms into Fire Mario, scaring the Koopas off. Upon returning to his house, Toad expresses that he thinks he should be allowed to use the wand since he led the way to the ambush and saved the wand, but the others refuse to let him do so, with the messenger adding that only a trained magician is allowed. The Wizard King, meanwhile, watching this on his crystal ball, agrees, and heads off on his ironically-named snail, Faster Lightning, to go pick up the wand himself. In spite of the messenger's warning, Toad sneaks the wand out of its case and makes use of it anyway, saying to himself that he should protect the Princess (who is taking a nap at this moment). After demonstrating the wand's magic by bringing a tea set and a chair to life, Toad decides to produce tough guardians out of some nearby discarded pipes outside his house. However, when he creates a pair of giant anthropomorphic Pipe Creatures, they rebel against him and take the wand, which they then use to animate a pile of blocks (resembling Pile Driver Micro-Goombas) that they sic on Toad. Running from the jumping blocks, Toad bumps into the Mario Bros., who are curious to this development. Toad claims that the wand jumped out of its case, but the Marios are skeptical. Putting this aside, the three of them flee from the blocks, eventually tricking them into jumping over a cliff. The Pipe Creatures, laughing at the Koopas. Meanwhile, Koopa and his kids (including Kooky, who suddenly appears from out of nowhere during the scene) are making another attempt to steal the wand, this time with the help of two Boomerang Brothers. Cheatsy spots the wand in the Pipe Creatures' clutches, and Koopa has the Boomerang Brothers knock it out of their grasp and into his. But Koopa is only able to turn the Pipe Creatures into his own minions before Kootie Pie takes the wand from him, saying that it is her turn now. At this point, the Princess wakes up and comes out of Toad's House, only for Kootie Pie to "place [her] under house arrest" by making the picket fence around the house grow larger and surround it. The Mario Bros. and Toad arrive on the scene just then, but then Bully takes hold of the wand and has the Pipe Creatures juggle them. Cheatsy then uses the wand to zap a Nipper Plant into a giant and commands it to eat them, but Mario breaks loose from the blue Pipe Creature's grip and rescues Toad from the purple one, seemingly forgetting to do anything about Luigi as well. Toad confesses that he took the wand out of its case, but Mario forgives him, offering him a chance to help with a plan he's developed. Mario tosses Toad up onto some nearby platforms up above. Cheatsy attempts to stop him by zapping the fence trapping Toadstool so that it goes after Toad, but it misses and hits the bottom of the platform he's standing on. Cheatsy instead focuses on sending the Pipe Creatures to chase and grab Mario and Luigi (the latter of whom managed to escape their earlier entrapment). Toad, trying to get the blocks to chase him. Toad, meanwhile, has headed to the bottom of the cliff from earlier, where the blocks landed. He gets the blocks to chase him and then runs towards the Koopas. Bully takes the wand again and sends the giant Nipper Plant after Toad, but Toad jumps out of the way so that the Nipper Plant is squished by the blocks. Koopa attempts to shoo Toad away, worried that the blocks might jump on him next. Fortunately for Mario, the Pipe Creature holding him brings him near some Jump Block, so he breaks out a Super Leaf and transforms into Raccoon Mario, allowing him to escape. At this point, Koopa takes the wand back from Bully, declaring that this is getting out of hand, but Mario then picks up Toad and has him grab the wand out of Koopa's clutches. 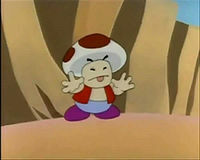 Toad then commands all of the magic to stop, at which point the Koopas attempt to escape. The Wizard King, taking the wand from Toad. The Wizard King arrives just then and takes the wand from Toad. He then uses it to change the Pipe Creatures (who were still holding Luigi captive up to this point) into a pair of hands that then grab the Koopas and drop them into a pipe that deposits them back in their castle. Toad afterwards apologizes to everybody for putting them through all this, but the Wizard King is just glad that he now has his wand, and thus can now do what he had been planning to use it for all along - roasting hot dogs. While the screen shows the telescope vision, there's a sky part at the bottom right. 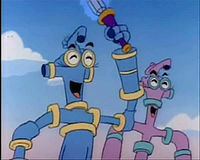 The blue Pipe Creature is the one holding the wand when the Boomerang Brothers throw their weapons, but the wand gets knocked out of the purple one's hand. Right when Koopa places the Pipe Creatures under his control, the giant picket fence can be seen in the background, despite that Kootie Pie hasn't enlarged it yet. When the Princess comes out of the house, Toad is somehow with her, even though he's actually with Mario and Luigi at this point. This same mistake occurs again when Cheatsy zaps the fence into going after Toad. This other Toad was perhaps actually meant to be the messenger. When Toad is running up to the Koopalings, Bully is not wearing his sunglasses revealing very small eyes. This is the only time his eyes have ever been shown. When Kootie Pie is pointing the wand at everyone, Cheatsy's eyes are green, Kooky is seen in the place of Bully, and when the Koopas are running away, Kooky is seen again. After Mario grabs Toad, he is not seen in the aerial view of Mario and Luigi running from the blocks, but he reappears held by Mario at the scene where they stop at the cliff. 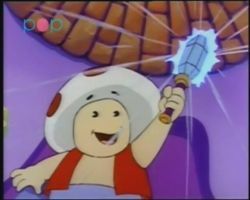 When Toad is waving the wand and says "To save us all, I must use the wand" the glowing light from the magic wand is misplaced. The Koopalings are laughing when Toad is running towards them, and Kootie Pie and Big Mouth look like they're still laughing even though their voices can't be heard. When the Wizard King arrives, Mario's raccoon ears and tail disappear. 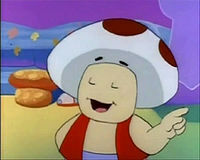 Toad is seen with the princess and in the mushroom house when Kootie Pie uses the wand to make the fences larger, but in the next scene, he is captured by the robot and is not with Princess Toadstool anymore. 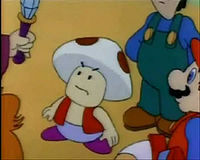 In the original version of this episode, when Fire Mario is shooting at Koopa, he responds reciting lyrics to the song. In the re-releases, he just says "great balls of fire", with the earlier lyrics silent (only Koopa's lips moving). The word, "Toadally" in the title of the episode is a pun on "totally". ↑ May 20, 2015. "A Toadally Magical Adventure", dubbed in Romanian by KidsCo. Odnoklassniki (OK.ru). Retrieved January 4, 2016. This page was last edited on March 24, 2019, at 19:43.